A second teenager has died after a sedan carrying seven people flipped over after crashing into a parked truck in Tustin, officials confirmed Monday. Jason Anguiano, 17, died Sunday evening at the Orange County Global Medical Center in Santa Ana, according to the Orange County Sheriff-Coroner. Anguiano was one of seven people inside an Infiniti M37 when it hit a truck near Legacy and Tustin Ranch roads Friday afternoon, the Tustin Police Department said. Pedro Fuentes is seen in an image posted to GoFundMe on March 24, 2018. The Infiniti M37 was designed to seat five people, according to a description of the vehicle on cars.com. The incident left another passenger, 17-year-old Pedro Daniel Fuentes, dead at the scene. Fuentes and Anguiano attended Century High School, according to the Santa Ana Unified School District. 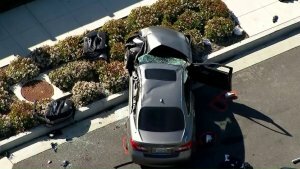 The other five individuals in the Infiniti M37—including two 17-year-old girls, another 17-year-old boy and a 20-year-old woman, according to the Orange County Register—were transported to nearby hospitals. Officials had not released details of their conditions as of Monday morning. Authorities said one person sitting inside the truck when the crash happened did not sustain any injuries. The driver of the Infiniti M37 lost control and hit a cement post while heading east on Legacy Road, investigators said. It spun out into the back of the parked rental truck and rolled over several times, Lt. Robert Wright told KTLA. Fuentes’ family told KTLA the car was only supposed to seat five, and that it appeared their family member might have survived if he was wearing a seat belt. They said Fuentes and other occupants in the vehicle were heading home from school. Speed might have been a factor in the crash, Wright said on Friday. As of Monday morning, investigators had not announced what caused the incident.